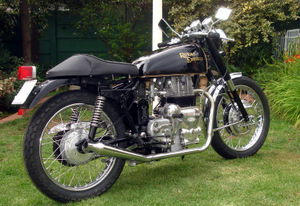 Nowadays, many people, especially younger bikers, ask what exactly are cafe racers, where and how did they originate? 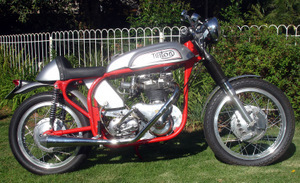 The café racer style of motorcycle originated and came into vogue in the UK during the early 1960s. These machines had a distinctive look of their own and were, in many ways, the first steps in what has today become known as road bike customization. Before the bikes came the game of record racing. Quite where this originated cannot be proved but early and popular examples were the Ace Café on the north circular road in London where a biker would put a record on the juke box, get on his bike and ride to the Hangar Lane roundabout and back again and be back in the café before the record finished. The South London variation was to be found at Johnson's Café, where the race between record and biker was down the bypass, through the S bends of the 'mad mile' round the roundabout and back again. In both cases, it was considered pretty much essential to hit 'The Ton' (100 mph) at least once. I've managed it at both the Ace and Johnson's Café in years gone by and when I look back; I'm still unsure quite how I survived. Café racers were or more accurately, are a style of bike, rather than any particular make and were often amalgamations of engine, frame and cycle parts from a variety of machines and manufacturers. 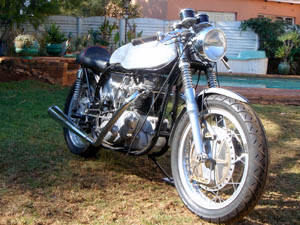 The desirable properties of a good café racer were style, speed and handling rather than comfort. but there were also a lot of other variations. If there was ever one standard machine to ever come out of the factory in the café racer style, it would, in the opinion of this old greaser at least, be the BSA 650cc Rocket Gold Star with the original RRT2 gearbox that was originally intended for the Isle of Man TT races.
. Japanese brakes are a particularly popular and very sensible addition. So, what makes a café racer? First one needs a fast lightweight machine with good handling characteristics, big (usually polished aluminium, fuel tank, small, and usually a single seat, clip on or other low handlebars & rearset footrests. In other words, these machines looked and usually performed very similarly to the racing bikes of the day and indeed, many were also used for that purpose. When the mid 1970s arrived, some of the motorcycle manufacturers decided to offer café racer style variations of their usual models. Amongst these were the Harley Davidson XLCR, the Ducati Super Sports and the Suzuki GS1000S. Although all of these offerings were extremely good motorcycles and are now very collectable in their own right, they never quite earned the same kudos as the real and ubiquitous café racer motorcycle of the 1960s. As the café racer is a constantly evolving style, it's not uncommon for machines such as Tritons etc to be fitted with modern brakes from Japanese and other machines nowadays. From the perspective of a classic motorcycle collector, this breed of motorcycle is a difficult, though fun arena to enter. Every machine is unique in its own right and this means that one doesnt have stop collecting café racers once you already have one in your collection.